Congratulations to "Debbie O. ", the winner in Nancy's giveaway. Thank you to all who participated! I’ve always loved spy stories. Their action-adventure and intrigue elements draw me in like a moth to flame. Add in a steamy romance, and I’m hooked. My parents named me Katherine Claire Billings, probably in the hope I’d have the life my mom figured a “Katherine Claire” should live—big house on the “right” side of the tracks, rich husband, elegant wardrobe, and maybe a servant or two. Instead, I blow things up for a living. Katherine Claire became Casey (from her initials, K.C.) when she went to college, the first in her family to do so. Growing up a mill town run like a kingdom by the mill’s abusive owner made her determined to escape that life and to serve justice. Now she’s an operative for the London office of a covert, multinational intelligence agency that was created to go around rules. She distrusts authority and social elites, likes to fly by the seat of her pants, and happens to be a little snarky. To build a solid romance, I needed a leading man. He had to be well matched to Casey, but they had to have deep-seated sources of conflict to sustain the number of books I’d planned. So I came up with an English earl, Jack, Lord Bainbridge. He works for the British government, believes in having a detailed, thorough plan and sticking to it, and doesn’t approve of agencies that work outside the rules. And he’s from an old, distinguished, wealthy family. 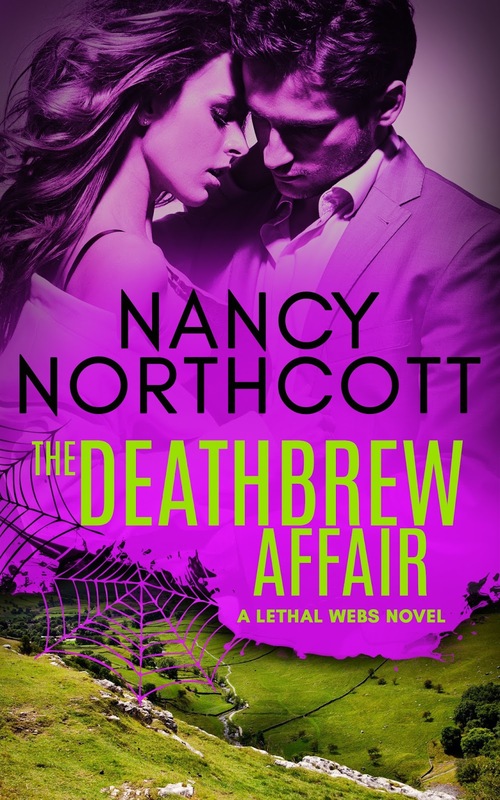 The Deathbrew Affair is the first book in the Lethal Webs series. It’s romantic suspense in all respects except that we stay with one couple throughout the series, instead of having a new couple featured in each book. Set mostly in England, which lets me indulge my Anglophile tendencies, the series centers on Casey and Jack and the growth of their relationship, currently projected to develop over ten books. Their adventures feature intense action, suspense, and hot romance. In each book, the romance and the action-adventure/suspense elements are equally important. I’m having a blast writing these books, and I hope you’ll enjoy reading them. He’s The King of Control Freaks. I’m the Queen of Winging It. Unless We Kill Each Other First. I’m Casey Billings, an American operative in the London office of a covert, multinational agency. I’m working with an MI5 officer, Jack, Lord Bainbridge, to bring down a bioterrorist who plans to unleash a pandemic. We’re posing as newlyweds to infiltrate the community that’s a cover for the bioweapons operation. Unfortunately, we don’t play well together, and not only because of Jack’s distracting, off-the-scales hotness. I grew up poor in a mill town, and he’s an aristocrat with more money than a Third World country. Besides that, I fly by the seat of my pants while Jack lives by his plans for every contingency and takes charge of everything. Including me. Or so he thinks. Basically, we’d like to strangle each other. But we have a pandemic to stop first. Slightly condensed from Chapter 2, Casey & Jack’s first meeting, in the office of her boss, Arachne. Tall, broad-shouldered and rugged, the dark-haired guy who walked in could’ve been a pirate in spite of the fine suit and navy silk tie. I recognized the level I am the boss look in his gray eyes from my mirror. It made me suddenly conscious that my hair reeked of L’Air de River Muck and my borrowed clothes didn’t come close to fitting. Nothing about him said effete, for sure, but I didn’t feel any better about this pairing. Me and Lord Pirate working together would be like two guys waltzing, both trying to lead. We shook hands. My pulse did a funny little hop. Too briefly for me to read, something glinted in his eyes. “Miss Billings.” He had a firm, fast handshake, with none of that silly I can break your fingers garbage. His glance noted my scuzzy appearance, but he didn’t comment. He sat in the armchair next to mine, and I caught an appealing whiff of cedar. He wasn’t one to waste time. Despite wishing him off my case, I had to admire that. But why did I feel so...conscious of him? To read Chapter 1, click here! Thanks for having me today, Maureen. If you have questions about the series or writing in general, I’m happy to answer them. If you’d like to share your favorite book or movie about spies, I’d love to chat. I’ll give a Kindle, Nook, or iBooks download of The Deathbrew Affair to one lucky person leaving a comment or email entry. Giveaway ends 11:59pm EST October 3rd. Please supply your email in the post. You may use spaces or full text for security. (ex. jsmith at gmail dot com) If you do not wish to supply your email, or have trouble posting, please email maureen@justromanticsuspense.com with a subject title of JRS GIVEAWAY to be entered in the current giveaway. I love spy stories! Especially the ones with operatives that make more mistakes than saving people. I LOVE the show Archer and the movies "Spy,the "Kingsman: The Secret Service" and the early James Bond movies. Nicole, my son and his friends just saw the second Kingsman movie. They enjoyed it a lot. We missed the first one but plan to catch up on it when we can. The dh and I are huge Bond fans. My favorite is Pierce Brosnan. Who's yours? Connery first then Brosnan. I've seen them all but the Craig ones...Not really keen on those. The dh and I noticed that the humor kind of went away in the Craig films. While we like his portrayal fine--and love Dame Judi Dench as M--we miss that humor, groan-worthy as it sometimes was. Yes! And for me,humor is key to any adventure. I grew up on James Bond played by Sean Connery (best Bond ever, in my opinion. I discovered an Ian Fleming book of my mom's when I was a teen. When I asked her if I could read it, she hesitated saying yes as it was a bit risque back then. After reading that first Bond book I was hooked and managed to get her to let me see the movies as well. While not so crazy about the newer movies, I still love a good spy novel now and then. debbiemac73 at Yahoo dot com. Debbie, I think Connery has the biggest following among Bond fans. He was great, though Brosnan is my current favorite. Your mom sounds like my dad. He would let me read anything he brought home from the library, but we had more intense followup discussions about some books than others. *g* The dh's family went to every Bond movie, but my parents didn't consider them kid-friendly, so I was in high school before I saw one. Hi, bn100--Bond seems to be the hands-down winner. Oh I just can't pick an all out favorite! I saw the Melissa McCarty movie Spy recently and I would 100% recommend it for anyone wanting to laugh out loud and not take anything seriously for a while! I haven't seen that movie (we're terrible about actually getting to the theater) but have heard great things about it. And she's just so funny! I noticed on your web site that there are currently three books listed for the Lethal Web series. Are more books planned for the series? Taurus, thanks for checking out the site! Yes, there are more books planned, all centered on Casey and Jack. After the three currently shown on my website will be a Christmas novella (which will probably appear early next year). After that will come four more novels and two more novellas, assuming all goes well. Many, many years ago when I was in college, I discovered Helen MacInnes. I read every one of her books I could find. I am sure they would be very dated now, but I enjoyed them then and they got me into suspense and intrigue reading. I haven't read MacInnes, Librarypat, but they sound interesting, Dated or not, I bet there are copies out there. I should check them out. She wrote back in the 1960's and dealt with cold war spying. Congratulations on your release, Nancy! So excited to see this book out there at last - have loved Casey and Jack from day 1! I've always had a soft spot for the Len Deighton books and also the Bourne Identity (book, not film). Film-wise, although Bond is a hit (never Sean Connery after I found out he hits his wife!) I enjoyed North by Northwest and Mr and Mrs Smith and on TV Mission: Impossible. Thank you, Anna! I've never read Deighton, though he's on my list, but I love Bourne. We were faithful viewers of Mission: Impossible when I was growing up.